Running business on e-commerce websites or marketplaces? If your answer is the latter, let’s debunk the myths. As a merchant, choosing marketplaces as your first stop to sell products is an intuitive decision. The easy-to-use and well-organized functions, such as payment systems and logistics delivery, make marketplaces appealing and irresistible to most entrepreneurs. While marketplaces seem to be providing tremendous convenience and possessing a huge customer base, little do many figure out is that starting at marketplaces is not an one-size-fit-all approach. They might not be the best place to start depending on your long terms goal. Many talked about the advantages of choosing marketplaces. We, thereby, decided to disclose critical and serious issues that entrepreneurs may not beware of and why you should avoid adopting marketplaces, if possible. What makes marketplaces stand out from e-commerce websites can make your online business collapse instantly. A customer-friendly interface may not be friendly to sellers. General marketplaces rely on product categorization to help potential customers quickly discover what they are looking for. This mechanism, however, makes seller’s products experience price comparison with similar substitutes in every item search. Unless the products you are selling are one of the kind and remain unique in marketplaces, listing products on marketplaces indisputably brings you into a fiercer battlefield of price war, which is inevitable in most cases and make the product margin ever lower. Worse still, the battlefield never shows a sign of stop as more Chinese manufacturers jumping into. It is almost impossible to compete with China-manufactured products in terms of price. Their huge scale of productivity can easily beat any micro or small sellers down with lower price but the same, perhaps better, quality. “Chinese factory is a nightmarish competitor. it is never a fair competition,” stressed Edison Chen, who is experienced in analyzing e-commerce development in depth and now working as Tagtoo business development manager. Think twice about the features of your products and avoid direct conflict with any of them especially if your products are not amazingly outstanding. The importance of utilizing data for company growth is widely recognized. With that said, adopting marketplaces may force you to yield the ownership of user data and give up the right to discover more customer insight. It happens in most general marketplaces. As opposed to e-commerce websites, limited amount of data regarding user behaviors on individual online shops is publicly available to sellers. Common reporting metrics, such as bounce rate and average page duration, on Google Analytics and other digital tracking tools are not provided in most general marketplaces, which makes entrepreneurs easily get lost on the track of company growth and make a wrong judgment call. Furthermore, sellers can not help but evaluate the online shop’s development based on transaction counts and other irrelevant data that don’t reflect the current circumstance and overall market status. The consequence of this concerning issue would become increasingly enormous and significant as the business possesses more and more customer base. The problem of lacking data undoubtedly would make sellers blind and never be able to identify real problems, if there’s any. launching online shops on marketplaces is suited to beginners or for testing purpose prior to soft launch, where scalability is not a pressing issue. If there is a bigger vision toward your online shop deep down, however, online marketplace is not where you should settle down. In fact, there exists the invisible ceiling that is almost impossible to overcome, when sellers try to expand, due to the the aforementioned two. The price competition deters sellers from earning enough margin to extend existing product lines and the data collection prevents them from gathering enough and significant user insight to come up with corresponding strategies. The combination of the two factors becomes the major restriction from moving forward and scaling up. In spite of experiencing rapid growth at the beginning, most newly-launched online shops of marketplaces would find the trajectory of growth rate slumps in an ever faster speed as the company size become bigger, according to Tagtoo’s years of observation on Southeast Asia e-commerce. Life 8, a leading leather shoes e-commerce in Taiwan, for example, is exactly the brilliant case of shifting from online marketplaces to e-commerce website. They saw the coming of the bottleneck and swiftly jumped out. Actually, this phenomenon of shifting to e-commerce website is decidedly observed in many countries, the US, the UK, Japan, for example, where e-commerce development is mature. History undoubtedly will be repeating itself again. This time in Indonesia. Growth rate is one of the key indicators of a business’ potential in the long run. The limited scalability underlying marketplaces, nevertheless, is what entrepreneurs are seldom conscious of in the early stage of launching and may incur undesirable dilemma of whether to stay or leave later on. Marketplaces and e-commerce websites both respectively have pros and cons. 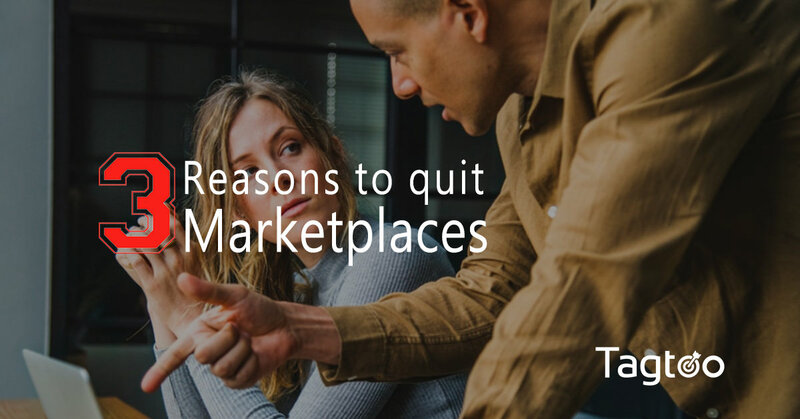 Under no circumstance should sellers embrace marketplaces because of the glowing testimonials among other online sellers. Not to mention the consistent endorsements is unverifiable and suspicious. Starting e-commerce websites may be harder than launching online shops on marketplaces. You should hold a strong belief that the time and effort invested will become the bumper harvest in the long run and the best decision you have ever made.